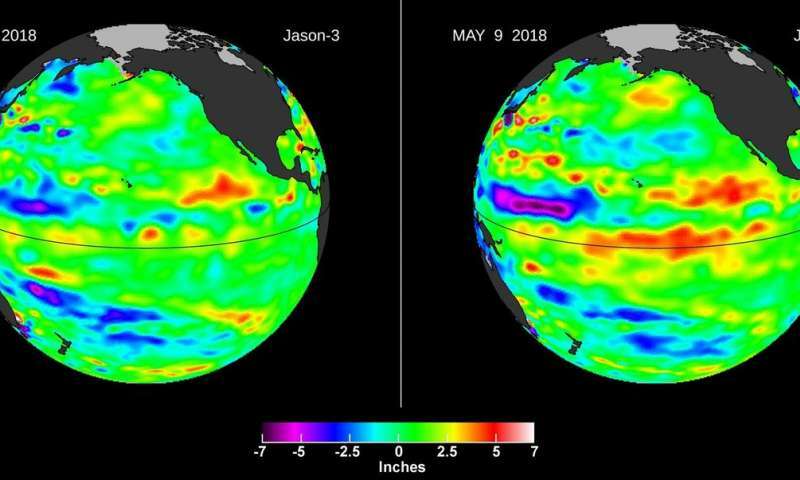 The Kelvin wave formed after a few short periods when winds changed from the prevailing easterlies to westerly—known as westerly wind bursts—in the far western Pacific in early 2018. In addition, there has been a general weakening of the easterly winds along the equator since January. Both of these wind conditions combine to create the Kelvin wave, which moves east along the equator and results in the spreading of warm water layers that are normally confined to the western Pacific Ocean eastward into the central Pacific. The red pattern visible at the equator on May 9 is the result of this downwelling Kelvin wave. El Niños happen when a series of Kelvin waves like this one spread warm water from west to east along the equator, causing high sea levels in the Central Pacific and sometimes as far east as the coastlines of Central and South America. The warm water is currently confined to the subsurface, with no warming at the ocean surface—a first indicator of an upcoming El Niño event. But forecasters at agencies like NOAA (the National Oceanic and Atmospheric Administration) and ECMWF (European Centre for Medium-Range Weather Forecasts) will be watching closely for more Kelvin waves like this one as summer approaches. Will the 2014 El Nino be like 1997? Could leftover heat from last El Nino fuel a new one?